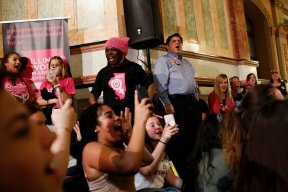 The minimum wage, abortion rights, and the state budget were among the rallying points for women marching on the Illinois Statehouse Tuesday. 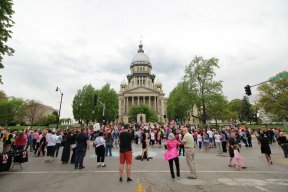 Participants came from across Illinois — women and a few men, carrying signs for a variety of causes: supporting women’s rights and immigrants, opposing guns, and urging passage of the Equal Rights Amendment. 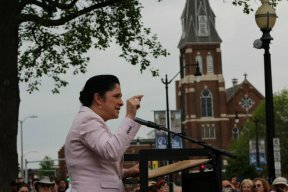 “Our communities are under unprecedented attack, and we need to stand together,” said Mony Ruiz Velasco, with the Illinois Coalition for Immigrant and Refugee Rights. The crowd also heard from five of the men seeking the Democratic nomination for governor, and met with senators and representative to deliver pink cards listing legislative priorities. The Capitol Police estimated about 1,500 people attended the march. 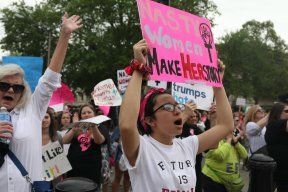 Organizers put the figure at more than 2,000.